Enveloped, spherical to pleomorphic, 175-215 nm in diameter. Capsid is round, exhibits icosahedral symmetry (T=189-217) corresponding to 1892-2172 capsomers. Linear, dsDNA genome of 170-190 kb. End sequences are complementary. Encodes for at least 150 ORF. Fusion with the endocytic vesicle membrane occurs; DNA genome is released into the cytoplasm. Transcription of early viral genes; replication of the DNA genome in the cytoplasm begins about 6 hours post-infection. Following DNA replication, late viral genes are transcribed including structural proteins. Assembly of new virions occurs in cytoplasmic viral factories. Endoplasmic reticulum cisternae are recruited and transformed to give rise to precursor viral membranes, which represent the first identifiable viral structures. Viral membranes become icosahedral particles by the gradual assembly of the outer capsid layer formed by protein p72. 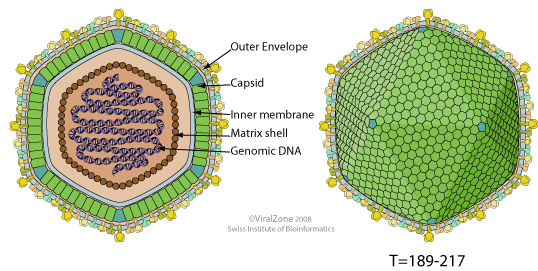 At the same time, the matrix shell is formed underneath the viral envelope and the viral DNA and nucleoproteins are packaged and condensed. Virions migrate to plasma membrane on microtubules and bud. ETYMOLOGY African Swine Fever And Related viruses. Several viral proteins from ASFV are dedicated to the modulation of apoptosis. For example, A224L prevent apoptosis of host cell by inhibiting caspase-3/CASP3 activation. Another viral protein, A179L, is a bcl-2 homolog and suppresses apoptosis.